Recently, 177 Lu was successfully labeled with zoledronic acid and its biodistribution was investigated in wild type rat studies, which demonstrated significant accumulation in bone tissue. However, the absorbed dose to each human organ has not been reported to the best of the authors' knowledge. 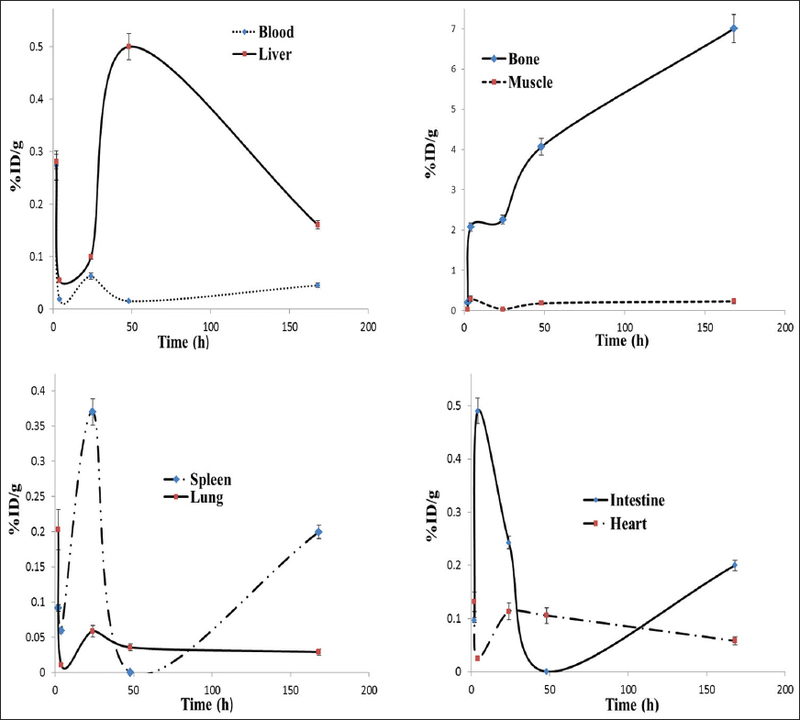 In this work, the absorbed dose to each human organ for 177 Lu-ZLD and 177 Lu-ethylenediaminetetramethylene phosphonic acid (EDTMP) [Figure 2] was evaluated based on biodistribution studies in rats by medical internal radiation dosimetry (MIRD) method. 177 Lu was produced by irradiation of natural Lu 2 O 3 target at a thermal neutron flux of approximately 4 × 10 13 n.cm−2 .s -1 for 5 days at Tehran Research Reactor (TRR). Zoledronic acid and sodium zoledronate were purchased from Sigma-Aldrich Co., UK. Whatman No. 3 paper was obtained from Whatman (UK). Radiochromatography was performed by using a Bioscan AR-2000 radio-TLC scanner instrument (Bioscan, France). Analytical high performance liquid chromatography (HPLC) to determine the specific activity was performed by a Shimadzu LC-10AT, equipped with two detector systems, flow scintillation analyzer (Packard-150 TR), and ultra violet (UV)-visible (Shimadzu) using Whatman Partisphere C-18 column 250 × 4.6 mm (Whatman Co., NJ, USA). A high purity germanium (HPGe) detector coupled with a Canberra™ (model GC1020-7500SL, Canberra Industries Inc, CT, USA) multichannel analyzer and a dose calibrator ISOMED 1010 (Elimpex-Medizintechnik, Austria) was used for counting distributed activity into rat organs. All other chemical reagents were purchased from Merck (Germany). Calculations were based on the 112 keV peak for 177 Lu. All values were expressed as mean ± standard deviation and the percentage of the injected dose per gram (%ID/g) amounts for each rat organ was compared using Student's t-test. Statistical significance was defined as P < 0.05. Animal studies were carried out in accordance with the United Kingdom Biological Council's Guidelines on the Use of Living Animals in Scientific Investigations, 2 nd edition. The approval of Nuclear Science and Technology Research Institute (NSTRI) Ethical Committee was obtained for conducting this research. The wild-type rats were purchased from Pasteur Institute of Iran, Karaj; all weighing 180-200 g and were acclimatized at proper rodent diet. 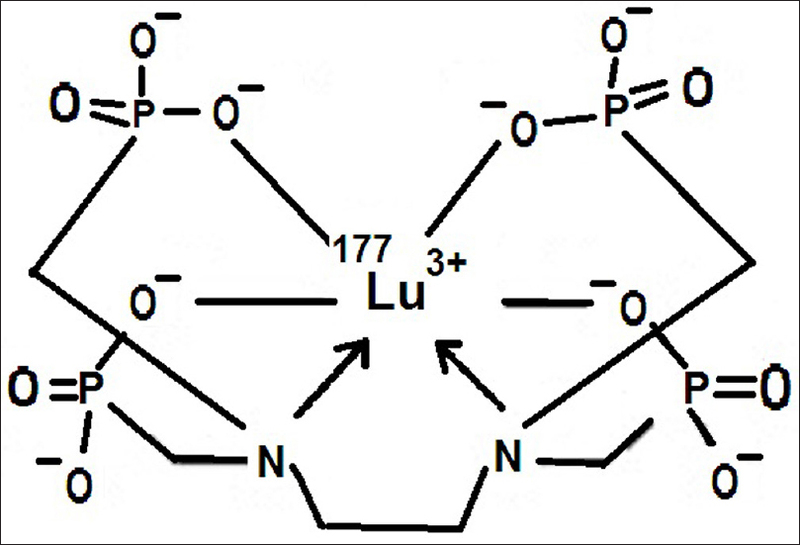 Lutetium-177 was produced by the neutron irradiation of 1 mg of natural Lu 2 O 3 (99.999% from Aldrich Co, UK) according to the reported procedures  at TRR. The irradiated target was dissolved in 200 μL of 1.0 M HClto prepare 177 LuCl 3 and diluted to the appropriate volume with ultrapure water to produce a stock solution of final volume of 5 mL (0.04 mol/L). The mixture was filtered through a 0.22 μm filter (Waters, USA) for sterilization. The radionuclidic purity of the solution was tested for the presence of other radionuclides using an HPGe detector for the detection of various interfering gamma-emitting radionuclides. The radiochemical purity of the 177 LuCl 3 was checked using two solvent systems for instant thin layer chromatography (ITLC) (A: 10 mmol.L - 1 diethylenetriaminepentaacetic acid (DTPA) at pH.5 and B: 10% ammonium acetate: methanol (1:1)). A stock solution of sodium zoledronate (molecular weight (MW) 334) was prepared by dissolution of the complex in double distilled ultrapure water, to produce a solution of 50 mg/mL. Radiolabeling of ZLD with 177 LuCl 3 was performed based on the previous literature. Briefly, 5 mCi (185 MBq) of the 177 LuCl 3 solution (0.1 mL) was added to the desired amount of NaZLD solution (1:50 ratios for Lu: ZLD). The radiochemical purity was determined using ITLC(NH 4 OH (56%):MeOH (100%):H 2 O (100%) (0.2:2:4; v/v/v) as the mobile phase mixture) and HPLC method. The final solution was passed through a 0.22-μm membrane filter and pH was adjusted to 7-8.5 with 0.05 mol/L phosphate buffer (pH 5.5). A stock solution of EDTMP was prepared by dissolving in 1 mol/L NaOH and diluted to the appropriate volume with ultrapure water, in order to produce a solution of 50 mg/mL. Radiolabeling of EDTMP with 177 LuCl 3 was performed based on the previous literature. Briefly, 5 mCi (185 MBq) of the 177 LuCl 3 solution was added to the desired amount of EDTMP solution (0.3 mL, 1-5 mg/mL). The complex solution was then kept at room temperature for 60 min. The final solution was passed through a 0.22-μm membrane filter and the pH was adjusted to 7-8.5. The radiochemical purity was determined using Whatman No. 3 chromatography paper or ITLC-silica gel (SG), eluted with NH 4 OH (56%):methanol (100%):water (100%) (0.2:2:4; v/v/v) mixture. The final complexes (100 μLincluding 3.7 MBq of radioactivity) were injected intravenously to the rats through their tail veins. The animals were sacrificed at the exact time intervals (2-168 h post injection), and the specific activity of the different organs was calculated as the %ID/g using an HPGe detector. Where Ã is the accumulated activity in the source organs and can be calculated by Equation 2. It should be noted that A (t) is the activity of each organ at time t.
The radionuclide was prepared in the range of specific activity of 2.6-3 GBq.mg−1 for radiolabeling use. After counting the samples on an HPGe detector for 5 h, two major photons (6.4% of 0.112 MeV and 11% of 0.208 MeV) were observed. The radiochemical purity of the 177 Lu solution was checked in two solvent systems. In 10 mmol/L DTPA aqueous solution (solvent 1), free Lu 3+ cation was complexed to more lipophilic LuDTPA form and migrated to higher R f . The small radioactive fraction which remained at the origin could be related to the other Lu ionic species, not forming LuDTPA complex, such as LuCl 4− , and/or colloids. On the other hand, 10% ammonium acetate:methanol mixture (1:1) (solvent 2) was also used for the determination of radiochemical purity. ITLC studies approved the production of a single radiolabeled compound at the R f 0.8, while Lu +3 retains to the lower R f due to the polarity. The HPLC studies also demonstrated the existence of only one radiolabeled species using both UV and scintillation detectors. Three rats were sacrificed for each time interval. The tissue uptakes of the complex were calculated as %ID/g [Figure 3] and [Figure 4]. It is clearly shown that the major portion of the injected radioactivity of 177 Lu-ZLD and 177 Lu-EDTMP was transferred from the blood circulation into the bones. Preliminary dosimetric evaluation of the complexes in human organs was performed by MIRD method based on biodistribution data in rat organs. First, the area under the clearance curves for each organ was calculated. Then, the absorbed dose was calculated according to the S factors in OLINDA software. The estimated absorbed dose in each human organ after injection of 177 Lu-ZLD and 177 Lu-EDTMP is given in [Table 1]. Furthermore, trabecular bone surface to other tissue dose ratio as target/nontarget dose ratio for 177 Lu-ZLD and 177 Lu-EDTMP is given in [Table 2]. Successful radionuclide pain palliation therapy is based on selective concentration and prolonged retention of the radiopharmaceutical at the skeletal lesions, while bone marrow dose should be kept as low as possible. For this purpose, β-particles of low energies are recommended. Among the β-emitter radioisotopes, 177 Lu (t 1/2 = 6.73 d, Eβ(max) =497 keV, and Eγ =112 keV (6.4%), 208 keV (11%)) has better characteristics. The significant advantage of utilizing 177 Lu is its β-particle energies which are adequately low, therefore the bone marrow suppression is minimum when it accumulates in skeletal lesions. , Therefore, different bisphosphonates with 177 Lu have been developed and used for the bone pain palliation. Specific uptake and retention in the target organ and rapid clearance from nontarget organs are significant parameters for the each radiolabelled complex. Low blood accumulation for both 177 Lu-ZLD and 177 Lu-EDTMP (<1.5%) demonstrated rapid washout from blood circulation. Besides, accumulation of both compounds in the bone increases with time up to 168 h which shows long-term retention of the complexes in the target organ. There are two major sources of toxicity from these radiolabeled complexes: Unchelated lutetium and the accumulation of the radiolabeled complexes in the nontarget organs. Lu 3+ metal has been found to distribute to the liver, spleen, and kidneys. Thus, it is necessary to keep as little unchelated Lu 3+ as possible to avoid uptake by liver and hepatotoxicity. Additionally, bone marrow toxicity is the most important point which should be considered for bone avid radiopharmaceuticals. While the absorbed dose of bone marrow is approximately identical for both 177 Lu-ZLD and 177 Lu-EDTMP, both of these complexes would have the same toxicity in bone marrow. The only clinically used Lu-177 bone pain palliation therapeutic agent is 177 Lu-EDTMP, which employed in early clinical trials in some centers in the world. , Consequently, for preliminary comparison of 177 Lu-ZLD as a bone pain palliation agent, the absorbed dose to each human organ for this complex is compared to 177 Lu-EDTMP [Table 1]. As expected, the highest absorbed dose for both 177 Lu- ZLD and 177 Lu-EDTMP is observed in trabecular bone surface with 12.173 and 10.019 mSv/MBq, respectively. 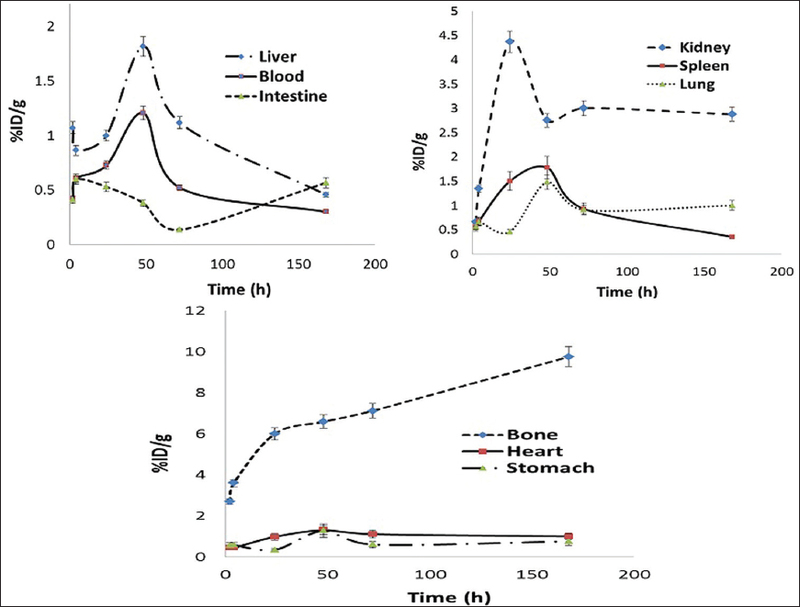 The importance of an ideal therapeutic radiopharmaceutical relays on the ratio of the absorbed dose in target organ to otherorgans. Therefore, trabecular bone surface to other tissue dose ratio for 177 Lu-ZLD and 177 Lu-EDTMP was calculated. While, the dose ratio of trabecular bone surface to the most tissue for 177 Lu-ZLD is in the same order or better in some cases than for 177 Lu-EDTMP, the trabecular bone surface to heart, kidney, liver, lung, and spleen dose ratio is considerably higher for 177 Lu-EDTMP compared to 177 Lu-ZLD, which puts 177 Lu-ZLD in disadvantageous situation compared to 177 Lu-EDTMP. In comparison to 177 Lu-EDTMP, the most important advantage of 177 Lu-ZLD is the dose delivered in other organs such as breast, intestine, testes thymus, thyroid urinary bladder, uterus, and even total body. Also, muscle uptake is considerably lower for 177 Lu-ZLD which can improve the quality of single-photon emission computed tomography (SPECT) images; therefore, the treatment can follow with better precision. In this study, 177 Lu-ZLD and 177 Lu-EDTMP complexes were prepared in high radiochemical purity (>99%, ITLC) at the optimized condition. Satisfactory stability in presence of human serum and final formulations was obtained for both of the complexes. The biodistribution of the complexes was checked up to 168 h post injection, showing fast blood clearance and major accumulation in the bone tissue. The absorbed dose to each organ of human for 177 Lu-ZLD and 177 Lu-EDTMP was evaluated based on biodistribution studies in rats by MIRD method. The highest absorbed dose for both 177 Lu- ZLD and 177 Lu-EDTMP is observed in trabecular bone surface with 12.173 and 10.019 mSv/MBq, respectively. In comparison to 177 Lu-EDTMP, the most important advantage of 177 Lu-ZLD is the dose delivered in the critical organs. Also, muscle uptake is considerably lower for 177 Lu-ZLD which can improve the quality of SPECT images, therefore, the treatment can follow with better precision. 177 Lu-ZLD complex demonstrated better characteristics compared to 177 Lu-EDTMP, and therefore can be a good candidate for bone pain palliation. Montella L, Addeo R, Palmieri G, Caraglia M, Cennamo G, Vincenzi B, et al. Zoledronic acid in treatment of bone metastases by hepatocellular carcinoma: A case series. Cancer Chemother Pharmacol 2009;65:1137-43. Tomblyn M. The role of bone-seeking radionuclides in the palliative treatment of patients with painful osteoblastic skeletal metastases. Cancer Control 2012;19:137-44. Berenson JR. Recommendations for zoledronic acid treatment of patients with bone metastases. Oncologist 2005;10:52-62. Major P, Lortholary A, Hon J, Abdi E, Mills G, Menssen HD, et al. Zoledronic acid is superior to pamidronate in the treatment of hypercalcemia of malignancy: A pooled analysis of two randomized, controlled clinical trials. J Clin Oncol 2001;19:558-67. Saad F, Gleason DM, Murray R, Tchekmedyian S, Venner P, Lacombe L, et al. ZoledronicAcid Prostate Cancer Study Group: A randomized, placebocontrolled trial of zoledronic acid in patients with hormonerefractory metastatic prostate carcinoma. J Natl Cancer Inst 2002;94:1458-68. Green JR, Muller K, Jaeggi KA. Preclinical pharmacology of CGP 42′446, a new potent heterocyclic bisphosphonate compound. J Bone Miner Res 1994;9:745-51. Nikzad M, Jalilian AR, Shirvani-Arani S, Bahrami-Samani A, GolchoubianH. Production, quality control and pharmacokinetic studies of 177 Lu-zoledronate for bone pain palliation therapy. J Radioanal Nucl Chem 2013;298:1273-81. Council B. Guidelines on the use of living animals in scientific investigations. Biological Council 1987. Manual for reactor produced radioisotopes, IAEA-TECDOC-1340. IAEA. Vienna; 2003. Bahrami-Samani A, Anvari A, Jalilian AR, Shirvani-Arani S, Yousefnia H, Aghamiri MR, et al. Production, Quality Control and Pharmacokinetic Studies of 177 Lu-EDTMP for Human Bone Pain Palliation Therapy Trials. Iran J Pharm Res 2012;11:137-44. Sparks RB, Aydogan B. Comparison of the effectiveness of some common animal data scaling techniques in estimating human radiation dose. Proceeding of the sixth International Radiopharmaceutical Dosimetry Symposium; Oak Ridge. TN: Oak Ridge Associated Universities; 1996. p. 705-16. Stabin MG, Siegel JA. Physical models and dose factors for use in internal dose assessment. Health Phys 2003;85:294-310. Bevelacqua JJ. Internal dosimetry primer. Radiat Prot Manage 2005;22:7-17. Stabin MG, Sparks RB, Crowe E. OLINDA/EXM: The second-generation personal computer software for internal dose assessment in nuclear medicine. J Nucl Med 2005;46:1023-7. Hosain F, Spencer RP. Radiopharmaceuticals for palliation of metastatic osseous lesions: Biologic and physical background. Semin Nucl Med 1992;22:11-6.
de Ligny CL, Gelsema WJ, Tji TG, Huigen YM, Vink HA. Bone seeking radiopharmaceuticals. Int J Rad Appl Instrum B 1990;17:161-79. Lewington VJ. Targeted radionuclide therapy for bone metastases. Eur J Nucl Med 1993;20:66-74. Yousefnia H, Jalilian AR, Zolghadri S, Bahrami-Samani A, Shirvani-Arani S, Ghannadi-Maragheh M. Preparation and quality control of 177 Lu-[tris(1,10-phenanthroline)lutetium(III)] complex for therapy. Nucl Med Rev Cent East Eur 2010;13:49-54. Flynn AA, Pedley RB, Green AJ, Boxer GM, Boden R, Bhatia J, et al. Antibody and radionuclide characteristics and the enhancement of the effectiveness of radioimmunotherapy by selective dose delivery to radiosensitive areas of tumour. Int J Radiat Biol 2002;78:407-15. Kesner AL, Hsueh WA, Czernin J, Padgett H, Phelps ME, Silverman DH. Radiation dose estimates for [18F]5-fluorouracil derived from PET-based and tissue-based methods in rats. Mol Imaging Biol 2008;10:341-8. ICRP Publication 62: Radiological Protection in Biomedical Research. Ann ICRP 1993;22. Yousefnia H, Zolghadri S, Jalilian AR, Tajik M, Ghannadi-Maragheh M. Preliminary dosimetric evaluation of 166Ho-TTHMP for human based on biodistribution data in rats. Appl Radiat Isot 2014;94:260-5. Yuan J, Liu C, Liu X, Wang Y, Kuai D, Zhang G, et al. Efficacy and safety of 177 Lu-EDTMP in bone metastatic pain palliation in breast cancer and hormone refractory prostate cancer: A phase II study. Clin Nucl Med 2013;38:88-92. Shinto AS, Shibu D, Kamaleshwaran KK, Das T, Chakraborty S, Banerjee S, et al. 177 Lu-EDTMP for treatment of bone pain in patients with disseminated skeletal metastases. J Nucl Med Technol 2014;42:55-61.